French soldiers have shot dead a man at Paris Orly Airport after he tried to seize a weapon from one of them. An evacuation of the terminal was ordered after the incident. 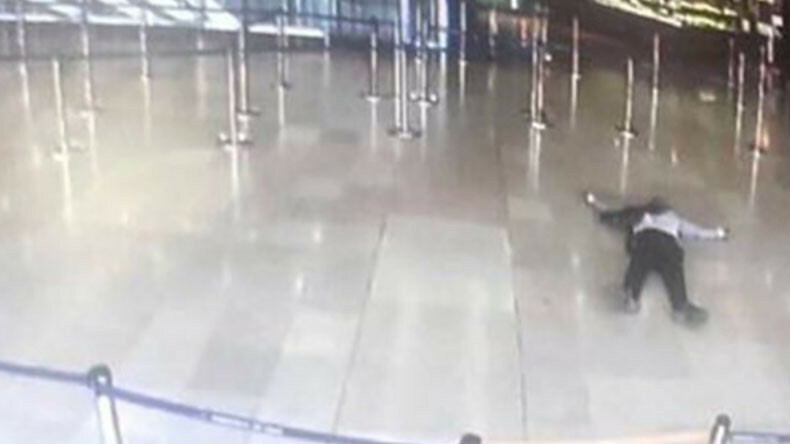 An unidentified man tried to seize a firearm from a French soldier at the airport and shots were fired by the French military in the ensuing altercation. "The man succeeded in seizing the weapon of a soldier. He was quickly neutralized by the security forces," Interior Ministry spokesman Pierre-Henry Brandet told Reuters. “We confirm that the man, who tried to seize a weapon from a soldier, has been neutralized,” the national police also told RT, adding that it would not disclose any detail immediately. Aside from the attacker, no other deaths or injuries are reported at the airport. The man is said to have acted alone. Police sources told Reuters he was known to intelligence services as a radicalized Muslim. Brandet later confirmed that the same attacker had injured a police officer in the northern Paris suburb of Stains earlier that morning. The shooting occurred after a police patrol had pulled over the man’s car for an ID check. Anti-terrorism prosecutors will probe the incidents. The Interior Ministry says that while terror motives are "possible," it is early to draw conclusions. The attacker's father and son have been taken into police custody, Reuters reported citing judicial sources. Around 3,000 people were evacuated from the terminal during the special operation, according to local media. Bomb disposal units were sent to the site to make sure the attacker did not have a suicide vest. No explosives have been found. Flights were suspended at both terminals of Paris Orly Airport due to the incident, with some inbound flights diverted to Charles de Gaulle Airport, Orly management said. The terminals resumed work later in the day. Some tweets reported a hostage situation, with several witnesses RT talked to confirming this. “He was holding the woman by her neck with the police officer’s gun in his hand. We understood the seriousness of the situation and fled. Later we heard several shots,” a witness told RT outside the airport. “When we entered the building, it was calm. Then, within several meters, I saw a young man. He took a female officer hostage and an evacuation happened very quickly,” another said. The gunfire sparked panic at the airport, a witness identified as Dominque also told BFM television. “The soldiers took aim at the man, who in turn pointed the gun he had seized at the two soldiers,” he said. He added that, after snatching the female soldier’s weapon, the attacker grabbed her by the neck and threatened two others, before being shot. Located 13 km south of Paris, Orly Airport was the French capital’s primary airline hub before the opening of Charles de Gaulle Airport, and continues to serve some 30 million passengers annually. It remains France’s busiest in terms of domestic flights. A similar incident occurred at the Louvre last month, when an Egyptian man sustained a gunshot wound after attacking soldiers guarding the museum. Prise d'otage à Orly Sud, opération policière en cours, l'aéroport évacué !